CreditMantri is contributing towards creating a healthy credit culture in the financial system. Ranjit Punja, 49, Founder and CEO of Chennai-based CreditMantri, is unlike of many other Fintech entrepreneurs. He spent over two decades with Citibank before the entrepreneur bug bit him. 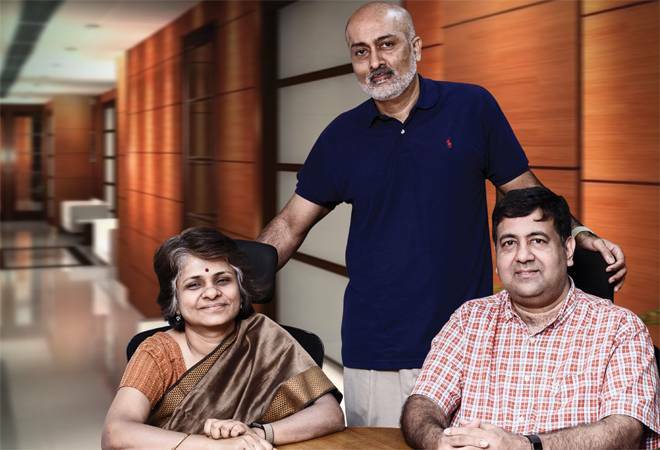 Ditto for the two other co-founders – R. Sudarshan, the Chief Operating Offer, and Gowri Mukherjee, who is the Chief Marketing Officer. The trio began their entrepreneurial journey in 2012 by offering credit improvement services or help borrowers improve their credit scores so that they could access credit from banks and non-bank finance companies. “The intention was to help people who are credit challenged,” says Punja. The business model has evolved to cover all kinds of customers from the ‘first time credit seekers’ to ‘credit challenged’ and ‘credit healthy’. Currently, this eight-year-old fintech firm is catering to over 10.5 million users with access to 3,000-plus data points. Over 55 lenders, including leading public, private and foreign banks and NBFCs, use its platform to source customers and participate in resolving past loans. Some of its big partners include HDFC Bank, ICICI Bank, Axis Bank, Bajaj Finance, Chola Mandalam, Mannapuram, Tata Capital, and others. Credit assessment of retail borrowers has been a pain point for banks, and given the challenges, CreditMantri has found wide acceptance. A decade ago, the expansion of credit bureaus like TransUnion, Equifax, Experian, and CRIF High Mark helped create a healthy credit culture, but also resulted in excluding many because of poor credit or defaults in earlier years. Punja wanted to help those who got excluded. “We offered the credit score free of cost,” says Punja. The free service turned out to be a big success. “It was a big turning point in the company’s journey,” he says. The start-up got $2.5 million under series A funding in May 2015 from Elevar Equity, IDG Ventures and Accion Ventures. The business model evolved to make credit efficient for all. CreditMantri offers services to banks and NBFCs for real-time credit decisions. The company uses traditional as well as alternate data points. CreditMantri also offers loans and credit cards to ‘new to credit bureau’ and existing borrowers based on alternate data sources. The free credit bureau score is the starting point. “The reason a lot of customers come to us is for a free score,” says Punja. Banks and NBFCs look at a potential borrower’s credit score to decide whether to lend to him or not. “We seek the customer’s consent and permission to complete the borrower’s profile,” says Punja. The credit profile is then built based on institutional data and includes credit score and bank statements, and also the customer’s social media presence. “These data points go into the ‘ASCII’ pillars of credit -ability, stability, contactability, intent and identity,” he explains. The entire profiling is done in-house. After this, customers are placed into three broad categories: credit challenged, new credit and credit healthy. “We want to facilitate credit for all,” says Punja. If someone wants to improve his credit score, CreditMantri steps in to help. There is a credit improvement or resolution service where consumers with poor credit history or low scores get help online and can also connect with lenders to clear their dues. This helps the credit challenged receive help in improving their credit history, and once that happens, banks or financial institutions are ready to offer them loans. CreditMantri tailors products along with lenders that are especially suited for the new-to-credit segment of potential borrowers. The product is also available on CreditMantri’s portal. “If you qualify (the profiling exercise), we will show you only those lenders that are willing to offer their products, including gold loans, education loans, and loans against property,” says Punja. But CreditMantri is not a product comparison site; more a facilitator of credit. In addition to this, CreditMantri has a credit gateway or a B2B profiling service for entities such as insurance, brokerage, furniture rental companies and others that are interested in credit profiling data. “In the past two years, we have tripled our revenues,” says Punja, without disclosing numbers. The business faces challenges in terms of government’s stance on utilisation of data and the future regulatory framework. “We maintain a very higher standard, but we do think about how things (data use regulations) will play out,” says Punja. Experts say the company will face competition from banks that are digitising and using artificial intelligence and machine learning to create better scoring models. Similarly, credit bureaus are also innovating to offer specialised services. “When there are more players, everybody becomes more nimble. And the end customer benefits,” says Punja.